Discussion in 'Items and Equipment' started by agosborne, Jan 12, 2016. @Gninja---can we please get a fix to x4 raid mobs (cube for example) dropping loot that is worse than the treasured gear from lower level named. 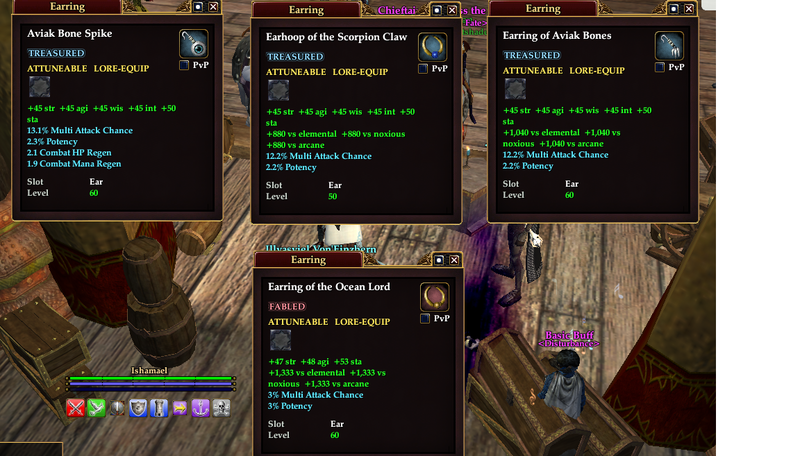 Specific example--- Earring of the Aviak Bones vs. Earring of the Ocean Lord. Thank you. 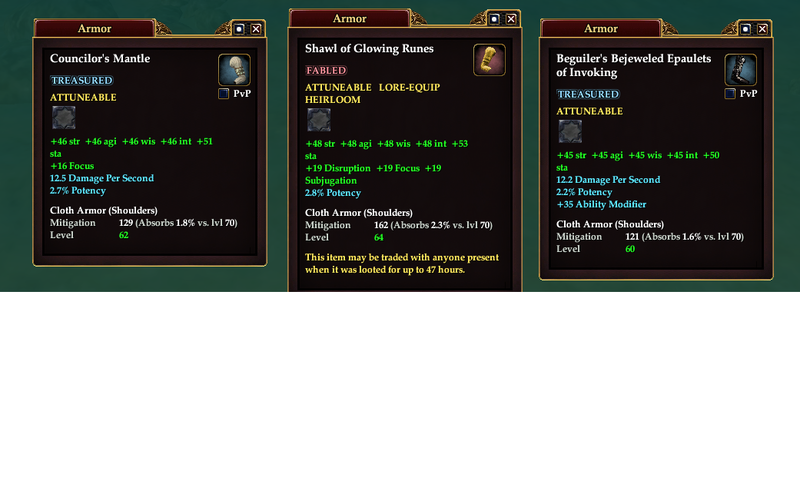 I can agree that the base stats are a bit low for that item but its 3potency versus 2.2potency. Also, level and mitigation is severely screwed up for level 75 epics (lvl 60 equip). “Also, level and mitigation is severely screwed up for level 75 epics (lvl 60 equip). Thank you for your attention Gninja---loving KoS! I can get behind the +30%ish increase on the potency from 2.2 to 3, but what about the other blue stats? The MA is 3 versus 12-13 on treasured pieces. What about doing the same +30% to MA/DPSMod/Haste and give the fabled raid loot closer to +16.5% MA/DPSMod/Haste in general please. While we're at it, can we look into the severe lack of physical mitigation on ANY gear. I recall many items that had +150ish vs slashing/piercing/crushing back in the day (Cuirass of Protection, Ichor Filled Thorax, some weapon I forget the name of, and a shield I forget the name of). It would be nice to have some of that back on these types of items. It made these items amazing tank items. In the case of the shoes, the stats were changed to add plus weapon skill with some haste if I recall correctly. Both are listed as lvl 60 though and I believe their mit reflects that. These mobs were level 70x4s originally. Now they're lvl 75. So we're moving up from a level 62 legendary to a 68 fabled. Gain 15 ministration, not like I have that on every piece already. Blackscale leggings actually have less stats than pretty much any other treasured. Not a specific comparison because every plate leggings is probably better. Relic armor is nice, at least for my warden it looks good. But these other "sets" from labs are a bit lacking still. As are most of the pieces of jewelry. We are going through the relic stuff and making sure the stats are correct. There were a few that were too far off and we are correcting those. Having said that the changes being made might not be drastic in every case, but when you kill stuff in raid the loot should be an upgrade in most cases. Obviously we can't hit every item in the game but there should be items for every slot for every class in each of the different types and difficulties of content. Still working on a broader list to send over to Gninja but anyone concerned with itemization should treat this issue seriously and find and post examples and suggestions. Notes: Troll Gut Rope is from one of the hardest end expansion raid zones that is blocked by a long progression/access quest. Strap of the Sky Warrior is from a solo quest reward in Barron Sky ‘In a Pile of Rubbish’.. takes 5min to complete. Is risk/reward and time/effort aligned for such a small incremental upgrade? Suggestion - increase Stamina to a value between 55 and 60. Increase other stats to a value between 50 and 55. Thanks to the generous offerings of a particular person I was able to find a FULL list of raid items and pictures of their current TLE stats….so here comes the wall of text. Definitely the easiest raid available to us at this time, I’m expecting most sidegrades/fill in the missing gear type stuff from this which the nice upgrade here and there maybe. Should probably compare with the VERY good drops of Den and HoF. Fists of the Slashing Claw – Need 5.0 delays. Rest is fine except for the awkward 2.5% potency. Seems high for a level 62 weapon considering DT gear is around 3% potency and labs is dropping 2% potency at the moment. And this is only legendary...Almost 100% sure no brawler who is actually able to raid this zone will ever use this. Skull Cap of the Slashing Claw - Leather with ministration, obviously druid gear. Hoo'loh hat is better and also heroic. Charm of the Slashing Claw - Worthless. AE Auto is a worthless stat when under 5%. Most raids don't require mass AoE and usually the mages can handle it, I'd rather our scouts be pumping out as much single target damage as possible. Axe of the Slashing Claw - Nice tank item because of the hate gain, but we still run into the problem that this raid zone is dropping level 62 legendary gear so the damage rating is next to worthless. There's a whip from Nest or Den with similar stats, is treasured, and has defense on it. Think it was the Devolving Whip. Charm of the Flapping Wing - So a 63 legendary, this is a solid item with maybe too much potency considering it still has more than most Labs gear and is a level 63...legendary. These legendaries should not be comparing to any 65+ fabled gear. Barbute of the Flapping Wing - Still too much potency is my RELIC gear only gets 2%. Nice defense though. Stamina went up 1 point from treasured gear, but it isn't a problem because of that defense boost you get, can't have your cake and eat it too. Tonlets of the Flapping Wing - Focus tells me cleric or maybe even SK/Pally...if they're into that. None of the above really care about that attack speed. See previous comments on potency. Bow of the Flapping Wing - This is good, I like this. People might not like the accuracy stat simply because of how much Weapon Skill they can get from everywhere though. DPS might be nice, or even some Attack Speed because scouts love their attack speed, especially rangers. Please compare this to the level 60 version of the Freeport timeline bows though (Longbow/Shortbow of Kain) and even the bow from Courts (Black Queen) and you might find a surprise of how iffy this bow is. Cap of the Icy Breath - Defense, worthless, and taking up space for another stat. I don't know about all mages but I'm pretty sure a particular Conjuror I know would love to not have his auto attack be 10% of his dps. The attack speed if worthless, replace it with 1% crit, or some 30-35ish ability mod. Heroic hat from Lord Septimus or even the cloth hat from the SOLOABLE spider name on the Drednever Crash Site island are better than this hat and immensely easier to obtain. Leggings of the Icy Death - Ooo shiny high stats with many disruption. There are TWO pairs of pants from DoF with 100+ ability mod that are almost irreplaceable, good luck. The only time I've heard mages say they MIGHT replace those DoF leggings is for some with decent crit (1.5-2%), 2%+ potency, AND that 47 ability mod, at least. Charm of the Icy Breath - Nice fill in the blank item. Any scout moving his way up into KoS raiding that didn't have access to the DoF stuff would probably throw this on until later. Wand of the Icy Breath - Compared to the procs on previous items from this zone, this is terrible. It does less damage than the 63 legendaries dropped earlier in this same zone. Proc needs to go up into the 400s imo. There is also a treasured dagger with over 100 ability mod on it that I'm sure most mages would use instead if they needed to. But, once again, with mage auto attack being close to 10% of the parse, that 15DPS and 15 attack speed on godking weapon is pretty tasty and hard to get rid of. Charm of the Fire Breath - Another good fill in the hole piece for progressing fights/scouts who didn't have access to some of the harder to get DoF items. Fists of the Fire Breath - 5.0sec delay please. Good item all around, I know a monk that would use this for sure right now. Coif of the Fire Breath - 1% AE Attack is still worthless, needs to be higher to be useful but even then most scouts would prefer DPS or attack speed or multi attack. No one will use this item when they can find some random treasured for 13% multi attack. I lied, Labs is next because I believe it to be the most relevant at this time and should be looked at asap. This will include relic armor at the bottom, yes, all of it. Overall observations - 42 main stat is less than level 60 treasured gear. All potency is less than the potency from dungeon items. In fact, most blue stats are a bit lower on these raid items than they are on dungeon gear. Since I put this hear, I'm not going to talk about the values of the stats but rather what stats are on the items. Wurmscale Band - Probably already saw my post about this as my random example in a post above. About as close to worthless as possible. Is missing stats and the one blue stat it has is being beat by most treasured gear. ANY treasured ring is better than this ring at the moment. I think this would be a great spot to put in some defensive stats on a ring, bit of hate gain, throw in some physical mitigation, make our tank nice and happy at the beginning. Doomseer Leggings - Holy hell these are amazing. My only issue is that 2% potency is actually less than most (read any) gear from dungeons, but the crit and ability mod and that power clicky surely make up for it tbh. Doomrage Greaves - I think these are pretty solid, for a beserker. Obviously a Guardian much rather have defensive stats but they also need to share with the zerkers. Maybe guardians can find some leggings elsewhere in labs, like relic, we'll get there later. Draketooth Hoop - Ok, made for healers and mages, I'm not happy with the generic stats of gear where everything is good for many different archetypes, but whatever, we'll get past that. It is OBVIOUSLY meant for a healer or caster due to the stats and yet we have multi attack on it. See previous post about how I'm sure most mages would appreciate having their DPS come from casting, not their auto attack. This needs ability mod on it, and the power regen is worthless. Dracomancer Pants - Why do these have a fourth blue stat? Random Multiattack. Also usable by all mages? These are supposed to subclass sets (these were for summoners if I remember right). Whatever, I'm sure these would be used. Blackcoat Leggings - All 3 blue stats are at under half of what they should be and are also 100% useless for an inquisitor. You can make these nice for both classes if you just make the set more focused on the spell casting side of an SK so the inquis can benefit from something. Oblivion's Edge - This was my favorite weapon in KoS, it looked so cool...moving on. It's a nice weapon, the 6sec delay though will make scouts kind of shy away from it in favor of something else. 6sec is usually used by tanks for some extra riposte damage or simply so they can spam more taunts in between attacks and this is clearly not a tank weapon. Making this 4sec might be a good idea since there are weapons out there with defense on them, and even a taunt proc (that might be DT though...). It's also a katana, they don't move slow. Animist's Leggings - I'm a druid, these make me all kinds of happy. They are only a minimal upgrade from Zhardiz's Leggings (spelling probably wrong) which has the exact same stats, but a bit more potency and a bit less ability mod. Nightchord Leggings - These were only usable by bards. All of the blue stats are much too low. Nemesis Leggings - These were predator only. Blue stats much too low but overall it seems pretty decent if they get boosted up. Adamantine Dragonfang - AE auto attack needs to go up or replaced. Attackspeed, multiattack, crit, really any of the above will be fine. Circlet of the Silver Skies - AE Auto attack needs to go up or replace. If I was in a raid (remember I'm a warden) I'd probably pass this off to a scout or someone whose auto attacks have more value simply because of the multi attack. Because of this, I'd like to see the AE auto attack turned into DPS mod. However, this necklace was a caster necklace in the original KoS, replace that multiattack for crit chance and the AE auto attack for .5% more potency or something and it would be good too. Draconic Deflector - I should never see a shield without some sort of defensive definition on it. Even if this was back in the original were some AAs required a shield, it was usually a buckler. This needs some defensive stats or a ward on hit proc, or something. Adamantine Doomhammer - Caster, hammer, usable by mages confuses me, as does the multiattack on a CASTER weapon. Unfortunately most casters only want 3 stats since you refuse to put in cast speed soooo crit chance is your only option instead of that multiattack even though this would be a cool spot for even 5% cast speed. Going to post this and make more posts because idk what the word cap is...if there is one. Nemesis Chain Gloves - Predator only, blue stats much too low, good otherwise. Blackcoat Gloves - Blue stats, low, also worthless for an inquis. Just throw some crit chance on it and inquiss might be happy enough with it. These gloves are only legendary, not expecting raid quality, but I am expecting small increases from heroic quality because they are still difficult to obtain. Dracomancer Gloves - Summoner only? Mana font, is nice, I guess. I don't like how only classes got this mana font and some didn't. Kind of disappointed on how it seems to have been randomly placed clickies and it really shouldn't be on a pair of gloves that can be obtained from trash runs. Other than that, these legendary gloves have the same stats as the fabled from this zone and I'm still sure mages would like to stop relying on their wand auto attack for their dps. Doomseer Gloves - I like these, these are nice. Animist's Gloves - I like these too. Man, wouldn't it be awesome if healers had more than 3 stats to care about. Doomrage Gauntlets - For a zerker, these are nice dps gloves. Any tank set will just go buy Chitin Plated Gauntlets from the broker and call it a day because these Doomrage Gauntlets don't have any defense and it isn't a significant mitigation increase. Firebrand Gauntlets - I guess these are a nice compromise for the 2 classes. Templar can use the crit and potency and the paladin will probably just go get the Chitin Plated Gloves. The Eye of Storms - Eyyyyy more scout gear. I guess they're good for auto attackers. Echolalic Band - LOL this is almost as bad as Wurmscale Band but oh wait, there's AE Attack...Ya know what, The Eye of Storms was a decent physical dps ring, in my opinion, so let's make this more focused on the healers and mages. That is to say that we need crit/pot/amod on it. Random thought I just had, and something you could do. I feel like many people would appreciate having a few items with jut heavy amounts of a single stat and have the option to mix and match. Maybe a ring with 5% crit but no other blue stats, or 60-70 ability mod, and no other blue stats. This would be nice after a while when we've gotten enough gear where we're looking for specific stats instead of just everything. Nightchord Gloves - Bard only? Good, stats low. Excarnate Handwraps - No defensive stats, low blue stats, brawlers unhappy with this lack of avoidance. Serpentine Skewer - This is a wonderful weapon, even though the proc is a dot, it's a 2 tick dot. The problem with DoT procs before was it would usually proc again causing the person to lose damage from the previous proc meaning that the actual value of the proc would go down as the duration of the DoT increased. This thing is a nice 8sec long and hits very hard to begin with so even if someone is unlucky and gets multiple procs in a row, they still hit hard. Nightchord Bracers - Bard only? Low stats, that's it. Doomrage Vambraces - Nice for the DPS zerker, worthless if they ever want to tank, guardian would never use since they don't dps. Nemesis Bracers - Predator only? Stats are nice, just low. That haste is pointless and actually can hinder. You only get 1 haste item and there is always FBSS with tons of haste on it, or Bangle of Manipulation, or some other item with more haste. There's a level 34 earring, Earring of Frenzied Voices, with 5 freakin' haste on it. Animist's Bracers - I like these. Still waiting for my mana font. Dracomancer Bindings - Summoner only? I'm irked by this dracomancer set having 4 blue stats on everything, it has all 3 that a caster really wants and then we through in a 4th because why not. The Twin Calamities - This is the 5sec delay one, there are 2. These are so perfect. That's all I have. The Twin Calamities - This is the 6sec delay one, there are 2. Let me begin with you rereading that last sentence and compare it to the first sentence for the one above. Yep, we have a set of weapons with 2 different delays on them. Please pick 1 delay for these. Other than that, these are nice, maybe throw some parry on it, or deflection, that high multiattack is good enough in my opinion though. Excarnate Wristguards - No avoidance stats. Low blue stats,good otherwise. Firebrand Armbraces - Remove attack speed, throw in ability mod, or Focus, and I think both classes would be content with this item. Blackcoat Armguards - Remove attack speed and put in crit and I think both classes would be happy. Belt of the Doomflight - If I remember right, there were 3 major belts in this xpac. This belt, the Doomslayer Belt, and Bone-Clasped Girdle. This belt was a bit mediocre because tanking was simple back then, just needed high stamina. So I'd like this belt to go back to tanking. Hate gain, defense, parry, deflection. Make this a tank belt. Doomslayer Belt - This was the melee dps belt. Has many weapon skills because that was a needed thing back then, not so much now, although they aren't frowned upon. Well, now it's a casting belt that doesn't even come close to Bone-Clasped Girdle. Just make it so the melee dps have a nice belt again. Throw some DPS/multiattack/crit on it and call it a day. And replace all those casting skill with weapon skills, or just remove the casting skills at least. Doomseer Bracers - These are good. Again, posting so I don't lose anything or hit word cap. @ Gninja Thank you for updating the earring from the cube mob. Also this mantle is found in Temple of Scale off a x4 named raid mob---it's a 12.5% drop and is comparable to these treasured shoulders that are easily obtained solo. Can you please put multi attack on it at 13%+ and increase the potency to 3.5%+ (normally shoulders have more than other pieces), and add 1.5 crit chance or 55 ability mod to make it reflect raid gear stats. Thank you for your help! @Gninja -- also take a look at the Dracomancer Vestament that drops from Lord Vyemm in Laboratory of Lord Vyemm---its a 6.25% drop and the chest Shroud of Darkness is better from heroic Halls of Fate. For the Dracomancer Vestament, to make it reflective of the raid difficulty, it should have more green stats (currently has less than the treasured as you can see), 13-14% multi attack (should have more than the other robes--it has less), 1.5 crit chance, 3% potency (not less than the treasured robes), and 55+ AM. Thank you for you attention in making these x4 raid items actually better than solo/group content instead of worse/equal. Frustrating. Gninja is obviously unwilling to accept that this is a problem. you know what i see? i see people busting their *** to take on the content and then getting super frustrated and quitting because they spent an evening dieing and pushing hard.. and then when they finally succeed in downing that raid mob or clearing a zone, all the loot is basically vender trash because its not an upgrade for anyone. We shouldn't have to do their work for them in threads like this... this is what we pay for. Ap0k and Bloodguts like this. @Gninja---any luck on looking at Shawl of the Glowing Runes and Dracomancer Vestament? They've already stated they're looking at all the loot. Don't expect a tweak to a couple pieces based on this thread.